1 to 2 tablespoon beef or chicken broth, using just enough broth to moisten. In a large mixing bowl combine sausage meat with the ground beef and mix well. Add the beaten egg, minced onion, pressed garlic, nutmeg, paprika, cumin, coriander, turmeric, cinnamon, ginger, breadcrumbs, parsley, cilantro, salt, and pepper. You can add 1 to 2 tablespoon of broth to moisten the meat. Mix altogether, until well combine. Make sure it’s well seasoned and the seasoning is well dispersed. Grease your hands with some cooking spray. 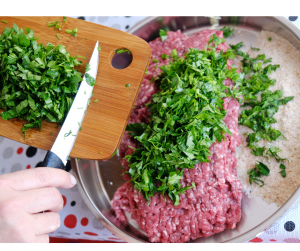 Scoop out some meat using a cookie scoop, or like I am doing here with a Chinese spoon and roll meatballs, into 1 inch diameter or circles. (You can make meatballs bigger or smaller according to your own preference). Place meatballs in a large skillet over hot olive oil over medium heat for 10 minutes or until browned, turning occasionally. Maybe prepared several hours in advance, up to a day. If you are not too spiced. Keep the spice out, but keep the parsley and instead of cilantro, replace it with fresh basil and don’t forget to add 1/2 cup of fresh grated Parmesan cheese to the pasta. You can replace cilantro with fresh basil. And here you have it. Enjoy! I love those meat balls, they were easy to do, and delicious. 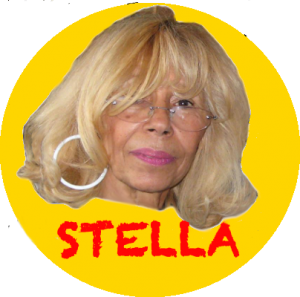 Hello Corine, glad to get feedback––Thanks, Stella.